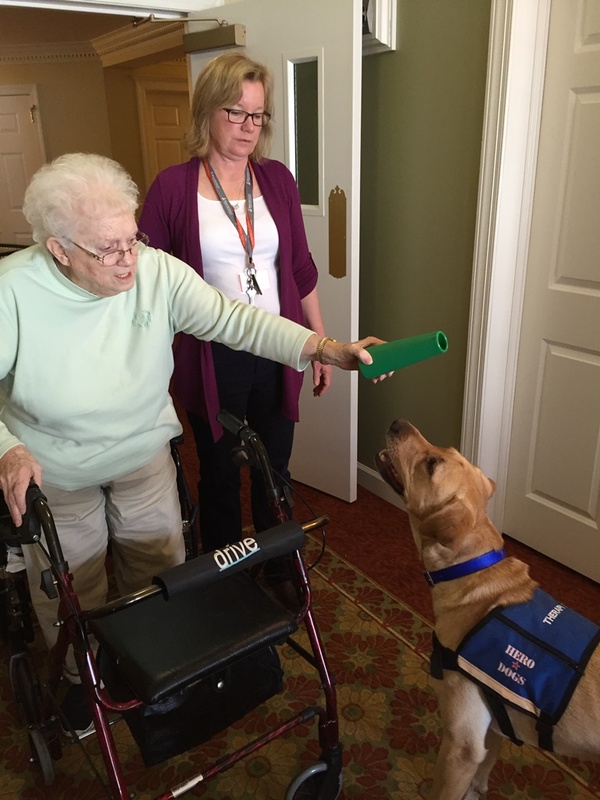 From time to time, Hero Dogs has a dog which is offered for placement to a qualified clinician or staff member in a residential or health care setting as a facility dog. A facility dog is not a service dog because it does not work with a single individual to mitigate the effects of that individual’s disability. 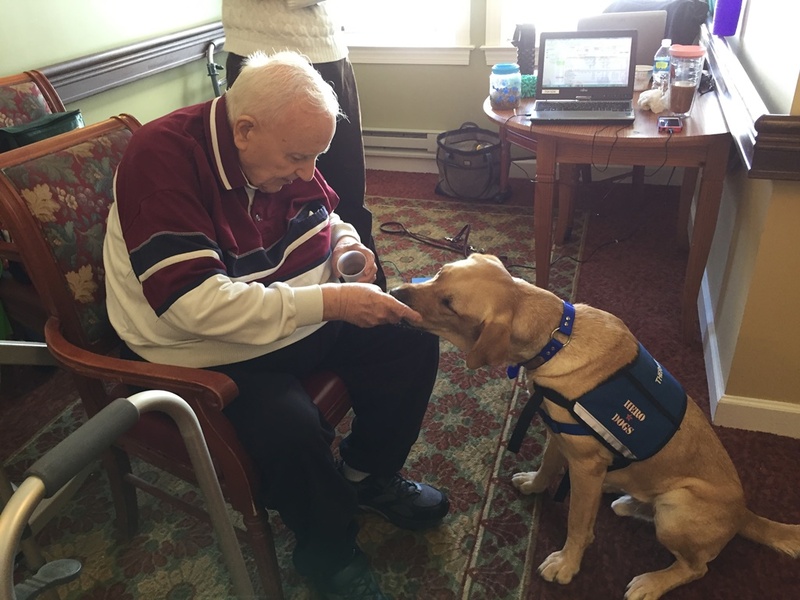 A facility dog is similar to a therapy dog, but unlike a therapy dog which may visit patients or residents at the facility accompanied by its handler for a few hours a week, a facility dog “works” full-time at the facility under the care and supervision of a staff member. 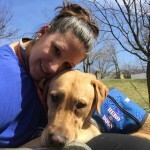 Additionally, while most therapy dogs bring comfort and companionship through visitation, a Hero Dogs facility dog actually works with staff to achieve specific treatment or program goals through animal-assisted therapy. Hero Dogs that are offered for placement as facility dogs will have generally had between 18 months and two years of specialized socialization and training in preparation for becoming service dogs. These dogs did not ultimately qualify to become service dogs, generally due to either a minor health issue or lack of confidence in a specific situation. For example, a dog might be fearful around traffic or on public transportation, or especially sensitive to loud sounds. Dogs selected to become facility dogs are highly motivated by contact with people, affectionate, gregarious, of moderate-to-low energy and drive, and calm and quiet indoors. The dogs are house trained, have good manners, extensive obedience training, and a large repertoire of specialized skills that can be used in a therapeutic setting. 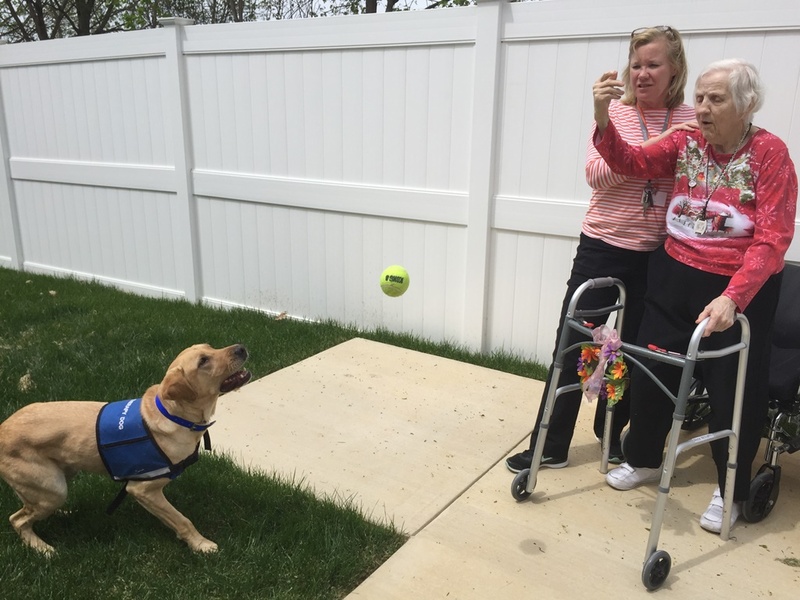 What are the benefits of a facility dog? Some examples of specific activities and outcomes that can be achieved with the use of a dog in a therapeutic setting are given below. What are the requirements for a facility dog placement? Following is an overview of basic requirements and expectations for the placement of a Hero Dogs facility dog. Hero Dogs prefers to place facility dogs in settings which serve large numbers of Veterans, military personnel, or military families, although this is not a requirement. The setting may be residential, inpatient, or outpatient. It may be a privately owned practice or a government or other publicly operated facility. Facilities should be within approximately 60 miles of Hero Dogs (Brookeville, MD). Although the dog will be placed as a facility dog, ultimate responsibility for the dog and for meeting the dog’s needs for safety, care, companionship, exercise, health, and training must reside with a single person. Dogs will be placed on a six-month trial basis with ongoing evaluation of the success of the placement, after which time the responsible party will assume ownership of the dog. While joint supervision of the dog among qualified staff members is permissible, joint ownership is not. An individual must sign the adoption and transfer agreement. It is expected that the dog will accompany the staff member to work on a daily basis. It is expected that the dog go home with the staff member each night so that the dog may have a respite from work and a normal and loving home/family environment, just as human staff members do. Other living arrangements may be approved on a case-by-case basis. During the work day, the dog’s needs for exercise, interaction, and rest must be met. The dog must be under the supervision of an approved staff member at all times when in the facility. The dog may not be permitted to roam freely about the facility. There are too many potential dangers – patients or visitors may let the dog outdoors, they may feed the dog things that are harmful or toxic to dogs, they may drop medications on the floor or try to give them to the dog. The dog must also be supervised at all times when outdoors. The dog must either be on leash or enclosed in a safely fenced area when outdoors. Even when in a fenced area, the dog must be under direct staff supervision – it cannot simply be left outside. The dog must have a comfortable, quiet area within the facility where its crate may be kept and the dog can be placed for its safety or simply when the dog needs rest and down time. Participating in therapy, particularly emotionally charged situations, can be very draining for the dog. Although the dogs offered for placement as facility dogs have had a high level of training, that training must be maintained if the dog’s behavior and skills are to be maintained. This necessitates a commitment from the staff member(s) to undergo training themselves, and to agree to continue to work with the dog on an ongoing basis. Approximately 32 hours of initial training will be required (generally divided as three days at Hero Dogs and one day at your facility) before placement. After placement, a monthly training session (3-4 hours) is required each month for the following six months. This follow-up training may be conducted at Hero Dogs, at your facility, or at the staff member’s home, as dictated by training needs. If the placement is successful, a certification examination is conducted at the facility at the conclusion of the six months of follow-up training. All usual expenses for owning and caring for a dog, to include high-quality food, dog supplies, local licensing/registration, monthly parasite preventives, and veterinary care. On average, these costs can be expected to total about $1,000 per year. However, a single veterinary emergency can easily cost $3,000 – $5,000 or more. The facility may wish to consider purchasing pet health insurance. Hero Dogs will provide you with an initial supply of necessary items at cost (estimate $750 – $1,000, depending on what is needed). 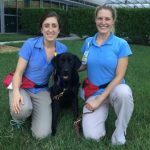 The costs of transportation (and lodging if necessary) for visits to Hero Dogs for your facility staff member(s) – initial training, six follow-up training sessions, and graduation. The costs of transportation (and lodging if necessary) for a minimum of three (3) trips to your facility for a Hero Dogs staff member – initial site and home visit prior to placement, placement, and certification. Additional visits may be needed for follow-up training sessions. If additional training or site visits are required or requested, Hero Dogs will charge a fee for staff time and travel. How do I apply for a facility dog? 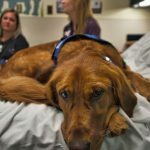 If you are a clinician who may be interested in receiving a facility dog, please fill out an application here: http://www.hero-dogs.org/facility-dog-application. 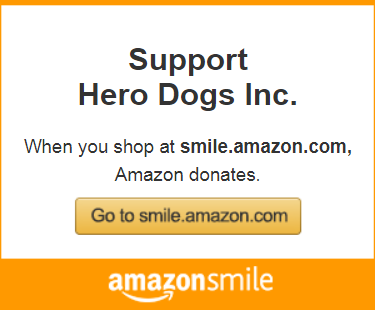 If you have additional questions, please call 888-570-8653 or email hero@hero-dogs.org.